The brewers at Last Rites are no strangers to giving their beers some pretty unusual names, from She’s No Bette Midler to The Big Smelly Doona. Often the inspiration for those beer names stems from day-to-day happenings at the brewery. And, while we hope that wasn’t the case for The Big Smelly Doona, it's certainly true for The Puddle Maker. 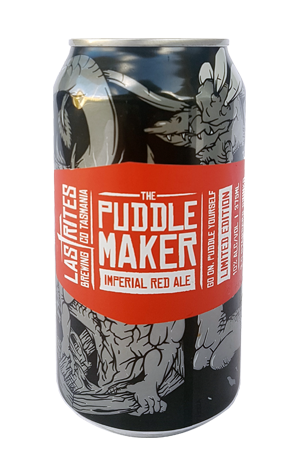 Named in honour of those brewers who can’t help leaving a puddle behind them whenever they go, the beer is an imperial red IPA big enough that brewing beer after trying one isn't recommended. It pours a copper amber with sweet malt driven flavours of toffee that are woven together with a noticeable booziness, unsurprising given it's a 10 percent ABV beer. But there’s also candied tropical elements in there – mango, pineapple and some grapefruit – that meld with the rich malts.